A previously unknown charcoal sketch of a dog by Vincent van Gogh has been revealed in a high-tech look beneath one of his paintings. Using a new technique based on "synchrotron radiation induced X-ray fluorescence spectroscopy", the dog seems to be a preliminary sketch for an intended painting. 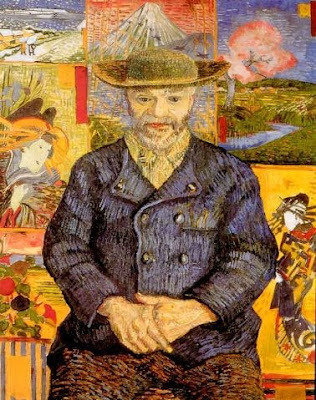 It appears that Van Gogh changed his mind and instead, painted over the sketch with a portrait of Pere Tanguy, a dealer who sold art supplies in Paris. 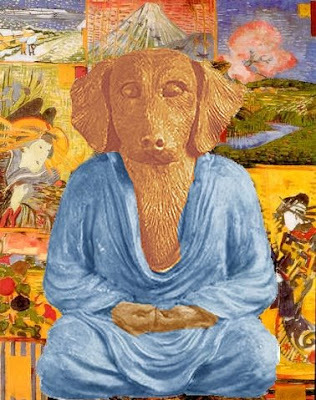 Art Von Dawggin, an art historian at the Van Gogh Foundation commented, “We only know of one other instance of a painting of a dog by Van Gogh, “Portrait of a Yoga Dawg”. The title of the painting has always been a bit of a mystery as to who this dog was and what exactly is a “yoga dawg”. We know that Van Gogh had an interest in Japan as he has painted many paintings with a Japanese motif. It has been speculated that Tanguy might have had a meditating novelty statue in his shop that he brought back from Japan along with the Japanese prints that he sold to Van Gogh and the other Impressionist painters. Scholars now suspect that this might be a second painting that Van Gogh intended to paint containing a ‘Yoga Dawg”. Editors Note: While researching this story, numerous references exist that seems to imply that there is an ancient Indian Rushi, a “YogaDawg” incarnation, that roams the earth and appears to yogis from time to time throughout history, to tell them a good yoga joke. 1. 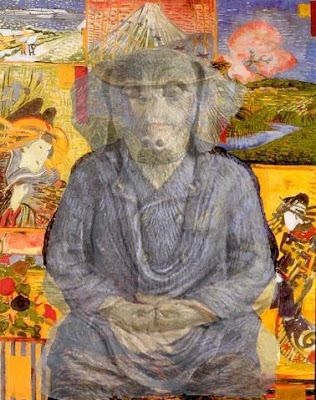 Van Gogh painting with ghostly image of a 'YogaDawg' underneath. 2. The Van Gogh painting the 'YogaDawg' sketch was found under Portrait of Père Tanguy, 1887. Oil on canvas. 3. What the 'YogaDawg' painting by Van Gogh might have looked like as visualized by Art Von Dawggin of the Van Gogh Museum. In ending, let me say it was my pleasure to be able to assist you in your release from hands of the evil yoga forces that caused the shutdown of your blog. I consider it my greatest achievement in the last eight years to have assisted you in the epoch battle between yoga-good and the decaying aspect of the Yoga Industrial Complex on our world. Who would have thought that members of the YLF (Yoga Liberation Front) were actually comprised of hand-picked persons of my kitchen staff and that they were so effective in getting your yoga blog back online? 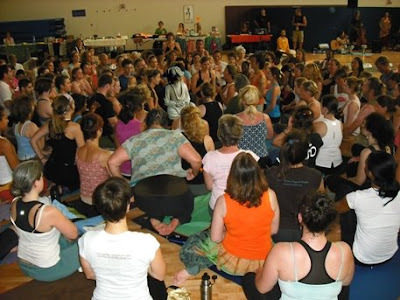 Wild rumors abound that the controversial and elusive yoga guru, YogaDawg, was spotted at the Global Mala celebration in Washington DC on September 21. Past attempts to photograph YogaDawg have failed due to his use of advanced yogic Siddhas (yoga powers). These have allowed YogaDawg from being photographed in public by eluding the paparazzi by either walking through walls, levitating out of windows or completely disappearing before his picture could be snapped. Why he has allowed himself to be photographed at this point is anyone’s guess. Some astute YogaDawg watchers believe that this may have something to do with his independent run for President of the United States. 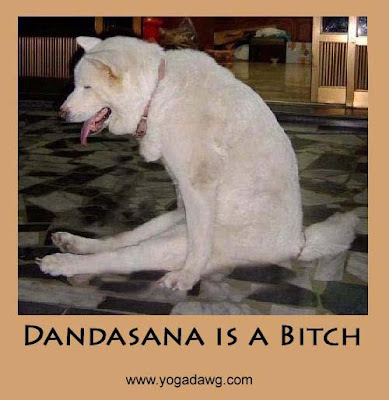 Others believe that it was simply the worldwide celebration of yoga that put YogaDawg in the mood to be photographed. In any event, whether the photos are real or not, yogis worldwide believe that YogaDawg may be slipping out his self-imposed exile since the time of the suspension of his famous yoga blog by evil forces of the Yoga Industrial Complex and Tom Cruise. Shiva Sunshine (her real name she claims), who attended the gathering is quoted as saying, “I know I heard a lot of insane laughing from somewhere in the crowd. From what I know from YogaDawg, I would swear that it was him. Unfortunately, I never spotted him but there seem to be a lot of smiling faces from the direction of the laughter. But then who know? It might just have been the Yoga that got everyone smiling ”. Is that YogaDawg in this photograph? Everything is in meltdown; housing, the economy, the polar ice caps; yogis are fleeing from yoga studios to hunker down in their homes for marathon sessions of yoga in an attempt to OM themselves from the chaos around them. The yoga mat is the last haven of safety from visions of an apocalyptic meltdown of civilization itself (Whew…). High end yoga clothes and frivolous yoga stuff find their way into consignment shops and yard sales. Today’s hot new yoga fashion is 'fuggetabouit'. Target is the new Lululemon! Expensive organic, free range, yoga themed foods gives way to back-yard and balcony ‘yoga gardens’ spouting ‘real’ food. The hip new yoga mantra is,” less is more”. But wait, there’s hope for 2009! All yogis Namaste for Obama to lead them from the economic Kali Yuga and save them from the abuses of the Yoga Industrial Complex. A yogic economic bailout is in the offering as the Yoga Progress Administration is initiated in the land. The most important thing to remember to do this year is to simply breathe…. In bankruptcy, Iceland is the first country to officially adopt the Yogo, the international yoga currency that has been slowly gaining acceptance with yogis worldwide. With food stocks down to 3 to 5 weeks, Iceland needs to quickly restore a proper foreign exchange market so importers can get back to normal business and avoid shortages, importers said on Wednesday. Since the crisis broke out on the north Atlantic island of 300,000 people, involving the government taking over the top three banks, suppliers to Iceland have cut credit to importers. Some have also demanded pre-payment for goods. A possibility of real bread lines in the country, the prime minister called for drastic measures to stem the crisis. “With the króna all but worthless, this Yogo is a good thing for Iceland”, said prime minister, Geir Haarde in a news conference. When asked why they would not accept a more formidable currency like the US dollar, the prime minister replied, “Ha ha ha ha ha ha ha ha ha ha …cough, cough …cough, cough, cough …………”, as he went into a coughing fit. The Yogo is of importance because with the global yoga economy reaching 800 trillion (in Euros), the Yogo had begun being used worldwide as the devaluation of global currencies continue, effectively replacing the US dollar for all yoga transactions. No downturn in business, even a global recession, has put a dent in the demand for yoga classes. The Yogo was developed as a currency of exchange among practitioners of yoga as a stable currency. Though in dire straits, Iceland is not yet ready to take the extreme measures that North Dakota proposed of renaming the entire state, Yoga, to attempt to stop the out flux of population from the state to warmer climates. 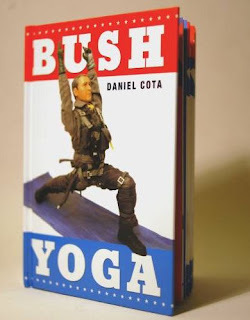 The concept though was not lost on the yoga practitioners there. “Well, I would love to see yoga play a more prominent part in the economy of Iceland. I don’t want to go back to fishing and Yogaland really doesn’t sound so bad for the country”, commented Olafur Ragnar Grimsson, President of Iceland.